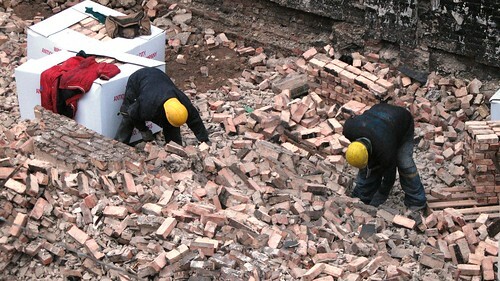 Oregon demolition contractors are keeping things green by recycling building materials. By reducing landfill waste and facilitating local reuse, Oregon building demolition contractors can support the health of our local environment. As recycled options are often less costly than their virgin counterparts, reusing salvaged building materials can also save residents and contractors money. Demolition clients also appreciate how green demolition approaches can minimize landfill fees. With all that said, it can be challenging to distinguish recyclable materials at a demolition site. As eco-friendly demolition knowledge is gained, one sees construction sites with new eyes. What previously appeared as so much trash is soon perceived as salvageable. The more you learn about green demolition, the more recycling opportunities you see. To begin, it’s helpful to learn the materials that are most commonly recycled from deconstruction. Asphalt is one of the most widely reused building materials. According to the Federal Highway Association and the National Asphalt Pavement Association, 99% of the asphalt removed from road surfaces is reused in new pavement projects. Recycled asphalt roof shingles may also be ground up and added to road pavement. Recycled wood may be used for paneling, flooring, and countertops. There is a unique beauty to reclaimed wood that is especially appealing to vintage designers. If left in landfills, drywall leaks toxic, smelly sulfate into local watersheds. Fortunately, drywall—which is simply gypsum sandwiched between two sheets of paper—can be reused in multiple ways. It can be processed to create new drywall, or used for wall patching. Gypsum may also be added to Portland cement to reduce the amount of C02 emissions used to create concrete. Finally, gypsum may be used in landscaping as a soil amendment to stabilize organic matter, improve water penetration, and encourage fast seed emergence. Even when recycled, glass retains its durability. As such it may be reformed into a wide array of objects, including windows. There are also less obvious ways to repurpose glass. For instance, Minnesota’s Ramsey County has found success mixing 10% recycled glass into asphalt for road surfacing. The county has also used recycled glass as a base layer for roads. Recycling glass prevents tons of landfill waste annually. Metals such as steel, copper, and aluminum can be melted down and reused. Steel is ideal for green demolition purposes because it can be used repeatedly and still retain its strength. Oftentimes, recycled steel is repurposed in large structures such as bridges. Green demolition saves millions of dollars each year and reduces environmental harm by keeping these precious resources out of landfills. Contact us today to learn more about how you might be able to capitalize on demolition projects while saving the earth’s natural materials. This entry was posted in Green Demolition, Scrap Metal Demolition, Scrap Metal Recycling and tagged green demolition, Oregon demolition, Portland building demolition, Portland demolition contractors. Bookmark the permalink.